All of our cottage rentals are 5 mins from Sandbanks Provincial Park. In addition two Of Our Sandbanks Cottage Rentals are located on a private sandy beach. Reserve your Sandbanks Vacation with us and stay in one of our four Sandbanks Cottage vacation rentals In Prince Edward County!! We offer the ultimate in stay and play packages in Prince Edward County near Sandbanks Provincial Park and Picton Ontario. All Vacation Cottages for rent include a free pass to Sandbanks Provincial Park, FREE Westlake Willy Waterpark for the whole week for everyone! and FREE Kayak and Paddleboard Rentals, a discount at Westlake Watersports Jet ski and Pontoon Boat Rentals and the New and Exciting Flyboard and Jet Pack Rentals! Take advantage of Westlake Watersports Kids Camp and drop your children off for the day to enjoy a fun filled day of watersports and memories, while Mom and Dad take advantage of a wine tour of Prince Edward County! It is Ontario’s newest wine destination. Book your Sandbanks Vacation early as our Cottage rentals fill up fast. We have 1 family trailer for rent this summer overlooking the water please click here for more Information. The “Sandbanks Beach Cottage” is a Beach Front cottage rental overlooking the Sandbanks Dunes on Beautiful West Lake!! Enjoy our beautiful and breathtaking sunsets on 130’ of sandy beach. The Rental cottage now has a full deck and two giant sliding glass patio doors on both sides of the cottage. This cottage rental near Sandbanks Provincial Park in Prince Edward County is within walking distance of Westlake Willy Waterpark, Jet ski, Sea Doo and pontoon boat rentals, Kayak, Stand up Paddleboard rentals and the new Flyboard and Jet Pack Rentals. The Sandbanks Beach Cottage Includes Free Kayak and Stand Up Paddleboard Rentals! Stroll along the beach in the other direction and enjoy the waterfront patio at Isaiah Tubbs Resort. This newly decorated 2 bedroom cottage rental has a large open concept kitchen and living area with a view of Westlake and The Sandbanks Dunes and is 5 mins from Sandbanks Provincial Park. This cottage is for rent from April to November – Two Bedroom Cottage – Sleeps 6- Saturday to Saturday Rental. This family cottage is perfect for your Prince Edward County Vacation located near Sandbanks Beach. You can book this cottage rental directly through us or we are listed on VRBO and AIRBNB. The main area offers an open concept kitchen, dining and living room. White pine wainscoting and pine ceiling create a warm calming airy light space. Large panoramic windows and patio sliding doors frame an exquisite view of West Lake with the Sandbanks Dunes in the distance. Fresh breezes from the lake waft through the cottage making air conditioning unnecessary, but there is a ceiling fan for calm still evenings. The living room has 2 couches facing the large floor to ceiling windows making for comfortable family gatherings. TV, DVD, VCR and SATELLITE for your entertainment. The patio doors lead out to the deck and the sandy beach waterfront. The kitchen is fully equipped with stove, fridge, microwave, kettle, coffee maker, toaster, cookware, dishes, glassware & cutlery. The eating area has a pine harvest table with 2 benches and 2 pine chairs. There are two bedrooms each with a double bed, the master bedroom has a dresser and wardrobe plus panoramic window to view the lake and capture its’ breezes. Kid sized bunks in bedroom #3. The cottage sleeps a maximum of 8 (4 adults Max & 4 children Max). The bathroom is a 3 piece with corner walk-in shower. A Beautifully landscaped rental vacation home surrounded by numerous fruit trees including Pear, Cherry, Apple and a Pecan tree. This House rental is Located in Prince Edward County on a 5-acre, secluded South-eastern Lake Ontario waterfront property, only 5 minutes from Sandbanks Provincial park, 10 mins from Picton. This luxurious house or cottage rental near Sandbanks Beach boasts a private courtyard with interlocking patio stones, a steel enclosed fire pit, and a BBQ to make your Sandbanks Vacation the perfect home away from home. Once inside this spacious open concept rental home or cottage you will experience the most breathtaking vacation property Prince Edward County has to offer. Pine and Oakwood streams throughout the walls, floors and cathedral ceilings giving this rental house the cozy country feel of a cottage. This Sandbanks rental offers a wood burning fireplace and a spectacular waterfront view. This 3500 sq ft` home comes fully furnished with 5 bedrooms and accommodates 14. 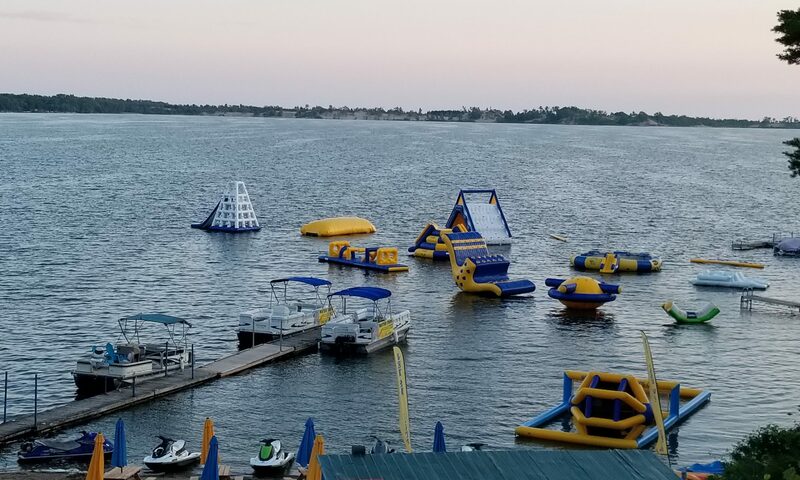 A free pass to Westlake Willy Waterpark is included and a discount at Westlake Watersports Jet Ski Sea Doo Rentals and Pontoon Boat rentals and the New Flyboard and Jet Pack! !